It's Pep Rally week and we are here today to share a sampling of the NEW Paper Smooches MAY release with you! TWO new stamps and TEN new dies will be available to purchase on April 30th at 8:00pm pacific time. Once our release goes live, you will find our new products HERE. Deadline: You have until midnight PT on Sunday, April 26th to leave a comment. Please check the Paper Smooches blog on Monday, April 27th to see if you are one of the FOUR lucky winners. A couple of our designers are taking a small hiatus to care for different things in their life. Amy Rohl is filling in for Emily and Jennifer McGuire is filling in for Pamela. We are so excited to have them join us in May! I filled my feather shaker with sequins, stars, small hexagon glitter, and large hexagon glitter. Mixing up the fillers tends to make them more sticky and they don't all fall to the bottom. I love the colorful mix! Now it's time for you to hop on over to the next stop on the hop, my amazingly talented friend, Jocelyn Olson! Love the feather shaker idea! So cool! So creative, very fun shaker card!! i love this design! very unique card! So unique! I love it - great talent you have!! Love your unique style IN. Great card way to go. Love how you used the die-cuts! I adore feather dies. They work for so many occasions. Great shaker idea! I absolutely LOVE this shaker!! I have to admit I'm totally borrowing this idea! So cute! Hey JJ your cards are always so clever!! SO PRETTY! that SPLASH of color on the white card is so striking! I'm a big fan of feathers. The shaker element is wonderful. 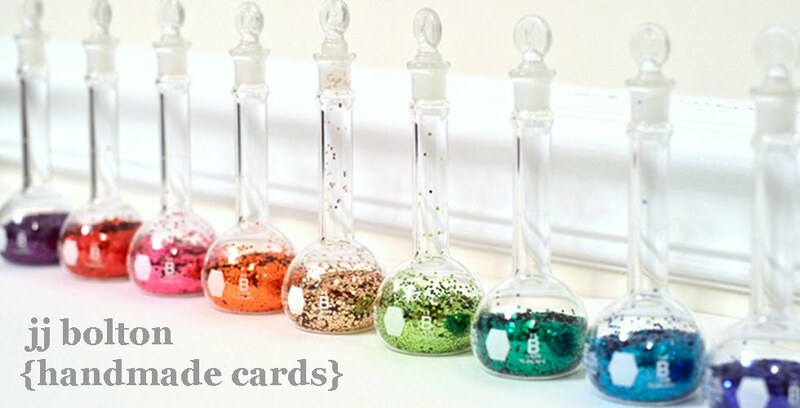 Such a clever idea for a shaker card! This is such a clever design!! I love your feather shaker!! Thanks for sharing! fantastic. Love how the feathers trail off the card on each end. Make the shaker out of one really makes it stand out. Great idea! I love that you only filled one of the feathers. Thanks for sharing. Fabulous! Love the feather shaker element! Brilliant! your card is unique as the sentiment. This is a very pretty CAS card. Love the color of the shaker elements against the white! I love your card.The falling feathers are so cool. Love what you did with the feathers and a shaker card bonus!! Great design! Wow! this is a very neat why to use the feather die...love your card! This is so cute. Love the shaker element. Clever shaker card! Truely unique with multiple feathers but just one of them is the shaker. What a gorgeous clean card. Love it! That's a fun card-would never have thought of a feather shaker-LOL! Great idea to go with the saying. Thanks for fabulous giveaway! !Your card is fantastic.I just love shaker card! I FB'd about the Paper Smooches blog hop and prizes. Your card is unique and the verse goes perfectly. Shakers cards make everyone happy. Aweee, sweetie, I love it! Oh my goodness,,, Such a beautiful and stunning card!!!!! Those feathers are just beautiful!!! I love the pop of color on white. Great card!! Such a fun shaker card. I love feathers. I love this and how you used the negative space! Love your feather shaker card. Lovely! What a beautiful shaker card! Love the colored mix of sequins against the white! Gorgeous shaker! Love Paper Smooches! What a fun shaker card. I would have never thought of using a feather. You are so creative! Thanks for sharing. Unique idea of filling in just one feather as a shaker. What a neat idea...love shaker cards! Great shaker card... love it! Your cards are always amazing and so inspirational! I love the way your thinker thinks! Love this card, looks so different! Love the shaker feathers. What a great card. Thanks. What a great design, love it! I love your clean crisp design with that added shaker flair! Mahalo for sharing!! I seriously love this card. What a great idea! What a creative idea for the feather dies! Love the uniqueness of it! Love this card... that pop of color really draws the eye. Having a blast on this pep rally hop! This is an amazing and unique card! Great idea for another use for dies. Love it. Fabulous card! Love the design and the shaker element... fun!!! Oh! Great idea for a card. Love it!!! Brilliant design and I love how you added all those fun, colorful elements for your 'shaker'! Love this card so much, JJ! Great shaker card. Thanks for the inspiration. Love how you used the die to make a shaker card! 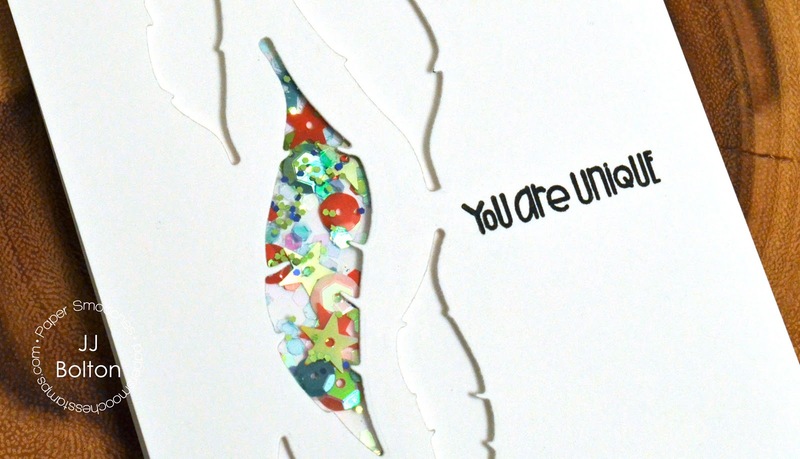 Love the feather shaker card and the "unique" sentiment! I love your colorful mix, too. Shaker cards are so fun. Totally original and amazing! Great design. Such a cool card! Love the mix of sequins! Love your unique shaker card! Oooh, I love this card! Thanks for the inspiration. I love your card! It is a great way to celebrate the fact that we are each special in our own way. It is a great card to send to that special friend who may need a little morale boost! What a cute card! I love the feathers and how you made it into a shaker card! Like your stand-out shaker feather - it goes great with the sentiment! what a unique card, never would have thought of making it a shaker card as well! Super great idea with the feathers! Thanks! Pretty!! Fun!! Thanks for the idea. What a FUN shaker card! Love it! Feathers are so pretty. Your card is awesome! Love the size of the feathers. This is one of the most amazing shaker cards EVER!! I LOVE the way you used the white card stock and then just zinged it with color with that shaker box. Really great design!! What a wonderfully fun shaker card. Thanks for sharing. Love your cascading design! The shaker feather is awesome. Best shaker card I've seen....love it. Great card to show off feathers with a shaker feather. Love the feather die cut and the shaker card. Very creative idea. So cool and creative, love it! What a unique, creative card! Love your idea! Love this clever, fabulous card! I love all feather cards & this one is really unique. Great job!! Lovely feather shaker card, so unique! Awesome shaker card! I never get tired of feathers and sequins!! I like your unique card design. what a clever way to use the feather die! Love the design and use of the products. This is over the moon with cuteness. Love the feather shaker card. Thanks for the inspiration, love the shaker idea! Nice cascading feathers and a shaker too! Very nice! Absolutely gorgeous! The cascading feathers themselves add so much to the card - the shaker is a bonus!! Such a great STORY with your layout and card design, JJ! You are a thinker : ) Absolutely love it!! Fantastic feather shaker card! TFS! Wow, what creativity! Thank you for sharing your talents. Your card is completely amazing! This truly IS a unique shaker card! Love the originality! Awesome idea... I've never seen a shaker card with feathers! Wow, so dramatic! LOVE your clean design! What an awesome shaker card JJ! Love the white on white with the pops of color from the shaker elements! I love shaker cards and this is really amazing! Must do! what a fabulous design with the falling feathers! Thanks for the tip on how to make shaker contents that are less likely to fall to the bottom. I love using feathers and this is a great shaker card - thanks so much! The shaker feather is awesome! Great idea. What an elegant way to make a shaker! Fabulous shaker! I love that the filler is the pop of color on this card. Such a great idea! I love your ice cream card too! Beautiful shaker card! Love all of those fun feathers! I LOVE this shaker idea! So cute and original! This feather shaker idea is awesome! Love it! your card is so beautiful and amazing, I love the cleaning in there! Love the line of the arrows and how you have them placed on the card, really organic and dynamic! Stunning, simple card, love these feathers! This is such a simple but stunning card, love it! I shared about the Paper Smooches DT Blog hop on Facebook too. My goodness, what a unique use of the feather die! Gorgeous card! Another cute idea for a shaker card. Have to try this one. What a fabulous idea! I love shaker cards! I love shaker cards and this one is soo cool! ABSOLUTELY FABULOUS feathers & shakers JJ - LOVE IT ALL!!! Beautifully designed card - so unique. Hi JJ!! Love this amazing shaker. Great release from PS! Thanks, Paulette S.
because Bogger won't delete my expired Profile with non working email address and outdated infor. Nor will they let me edit it! Such an amazing shaker!! I love that the sequins provide the color in this card!